The Isole Eolie (Aeolian Islands) consist of seven islands off the northern coast of Sicily that are known for their worth for vulcanology. These islands are Lipari, Vulcano, Salina, Stromboli, Filicudi, Alicudi and Panarea. Especially Vulcano and Stromboli stand out, as both have lent their names to types of eruptions (Vulcanian and Strombolian). 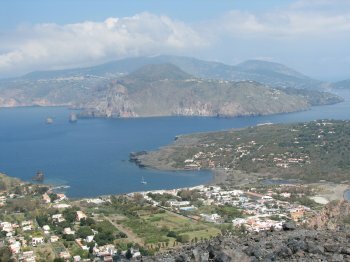 The Aeolian Islands are also among the earliest studied for their volcanic features (since the 18th century). 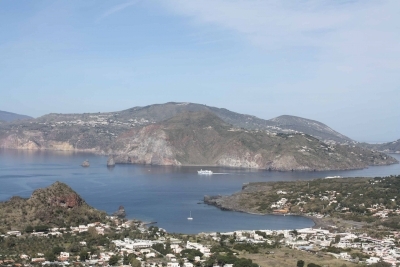 There are basically two options to get a glimpse of the Aeolian Islands in one day: join one of the mini cruises that take in most of them, or organize a trip yourself to one of the closest islands to the mainland (Vulcano or Lipari). I opted for the last possibility, and checked in at 9.30 a.m. in the rather scruffy city of Milazzo for the hydrofoil to Vulcano. There's no sign, but the smell tells you that you've arrived: Vulcano = sulphur. I choose this island because it could give me the opportunity to observe a sleeping vulcano from close range. There's not much else to see, besides wonderful views on some of the other islands. The climb to the crater takes about one hour. There's little shade and the first half hour is very tiring because of the steepness and the lush sand one has to wade through. 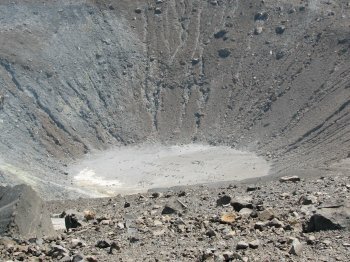 Once at the top, not the crater but the fumaroles catch the attention: cracks in the ground that let off a sulphurous steam. Other visitors even brought gasmasks to be able to withstand the smoke of these fumaroles! I just stood watching from a careful distance, enjoying this natural spectactle. I walked on the edge of the crater too, you can even follow a trail that leads to the bottom of the crater. March 2019 - day 3 we arrived in Milazzo. Next morining we took the fastboat to Vulcano. Seems to be the first choice for WHS enthusiast. Although it was only March this day was quite warm. Nvertheless, what sahll you do on Vulcona during off-season. Climbing the Vulcano was the only option. We followed the sulphur aroma and took the steep climb to the top. Nice views even to Stromboli and down the caldera. The natural environment is beautiful, maybe a bit to many houses on that island. Maybe thats different on the more remote islands. However, we enjoyed the trip to the island. I visited only Vulcano island as also other reviewers did. We traveled by ferry from Milazzo in October 2013 (be aware that train station in Milazzo is far away from the town and ferry port, and that there is infrequent or no bus connection between train station and the port during weekend and one has to take a cab), climbed the crater (very strong experience to see sulphur crystals + wonerful view over other islands of the archipelago), visited thermal baths nearby the port (I could smell suplphur on my skin even one week after), spent pleasent time on beaches (there are mineral spring directly underwater on the beach close to the port and thermal baths - Spiagga delle Acque Calde, while the beach just on the opposite side had black sand, which made water warmer - Spiagga delle Sabbie Nere), and - what was the most appealing - stayed overnighted directly in the nature in sleeping bags in the northernmost part of the island enjoying beautiful views to Lipari island. 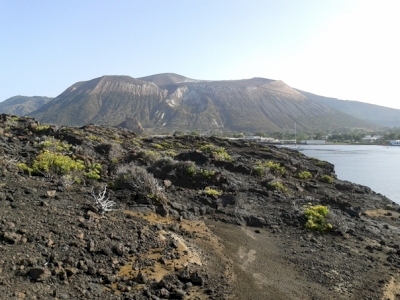 Photo - view from the northernmost part of Vulcano towards the crater. The Vulcano island was very tranquil (it was off the season in October) and literarlly warm. My dream is to visit also other island of the archipelago. Unfortunately this was a disappointing visit for us. We had booked two nights in Milazzo on the Sicilian mainland to use as a base for visiting the Islands, but on our first day the weather was perfect and the seas horrendous - no boats were running! The second day, the weather was horrendous but the seas perfect - boats were running but in heavy rain. 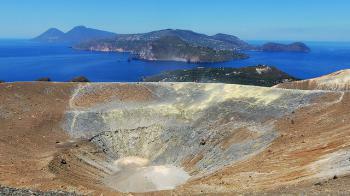 In the end we managed the ferry out to Vulcano, visited the sulphur vents just near the docks, and managed to climb up the crater as well. The hike was about as enjoyable as any hill-climb hike in heavy rain can be, which is to say not especially! We eventually admitted defeat in the early afternoon and returned to Milazzo, hoping to return another time in better weather. It does seem like a nice spot, but not one I can really leave an honest star-rating for. I visited this WHS in May 2015. Unfortunately I only set foot on one of the seven islands but I managed to get a great panoramic view of all the islands after climbing the volcanic crater of Vulcano. The climb is not a very strenous one and it only takes around 45mins of uphill hiking. The panoramic view is magnificent and well worth the effort. The trail is well marked and the terrain changes from earth to clay to old volcanic ash/lava to rocky which is quite remarkable for such a short hike. The trail is about 15 mins distant from the hydrofoil port and I had to make my way through a herd of local goats which were climbing the few trees and bushes beneath the volcano. 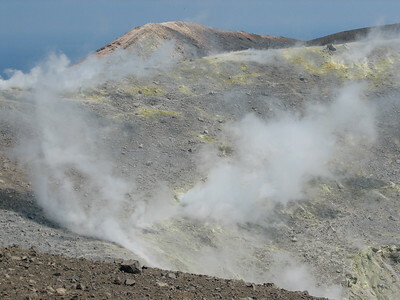 The volcano's sole activity now are the toxic sulphuric fumaroles which cause the rotten eggs smell close to the crater rim. Several forms of yellow/orange/white crystals can been seen and it's a great experience to walk round the crater to view them. I walked down the crater and then up a zig-zag trail to a higher vantage point over the volcanic crater to take some pictures. I'm happy with the photos I took but believe me no camera will beat the beauty and awe seen through your eyes. From the high vantage point the other side of the fertile island can be seen and the weather was so clear that I could see the snow capped Mt. Etna in the distance. 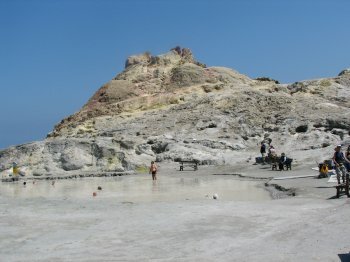 Next to the port, many tourists were enjoying themselves in the thermal mud baths of Vulcano but I decided to give this a miss. Vulcano is only 45mins away by hydrofoil from Milazzo and in the near future I hope to be able to visit the other islands possibly by sailing boat (Panarea has some splendid beaches and diving spots) and I wouldn't mind viewing Stromboli spewing lava by night too. Stromboli is the only volcano I didn't climb in Sicily (and the 5-6 hrs hike doesn't make me too eager to climb it either). The highlight of my visit was the outstanding view from Vulcano and the sulphuric crystal formations which to me was one of the best natural WHS I have visited in Europe. Homeric Locations: The supposed location of the Aeolian Islands where King Aeolus kept the winds, though the islands have also been thought of as floating about like the winds themselves, and it is generally safer to assume that the location of the islands is left deliberately vague.